I love pie. But I have to confess, it’s never been my strong suit as a baker. My pies tend to be respectable, but… Oh. My crusts sometimes shrink during blind-baking, and when I don’t blind bake I tend to find the bottoms insufficiently crisp. My crimping skills are so-so. I theoretically understand how to weave a lattice top crust, but I’ve never actually bothered to try it. I like my pies best when they are at their most rustic, like a haphazardly folded galette. For some reason, I’m more at ease when I’m freed from the pie plate. Which is part of what I love about these strawberry rhubarb turnovers. 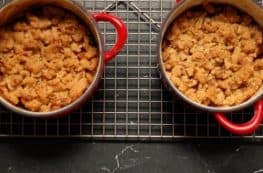 The other parts that I love about them are the golden flaky crust, the crunchy layer of big-crystalled sugar coating the outside, and also the well-balanced, perfectly thickened (not soupy, not gloppy) strawberry rhubarb filling. They’re adapted from The Hoosier Mama Book of Pie, which has recipes from Paula Haney’s excellent Chicago and Evanston pie shops. Whereas I am a pie dilettante, Haney is a pie master. When I want a treat at the Green City Market, the Hoosier Mama booth is the first place I go because they sell their turnovers (usually apple or cherry), which are not so big I feel like a glutton and are easy to eat while I walk around the rest of the market. I’ve never seen strawberry rhubarb turnovers at the market, though. I’m not sure if Haney even makes them in that flavor. It’s not one of the turnover flavors that appears in the book. But strawberry rhubarb pie does appear in the book. 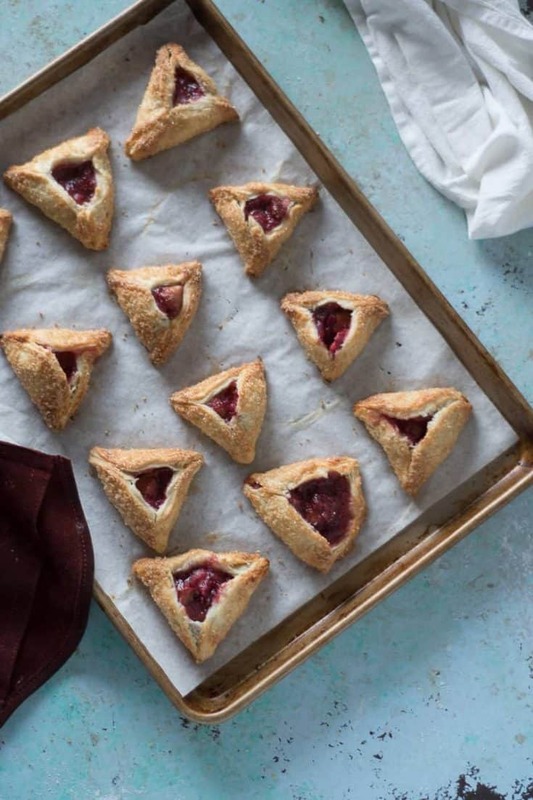 And with a little scaling and tweaking of the method of preparation, it was easy to turn the strawberry rhubarb filling into something sturdy enough to work in a handheld pastry with a shorter baking time than a full-sized pie. The dough is a butter and cream cheese wonder that needs some resting time but is surprisingly forgiving and that is incredibly flaky. 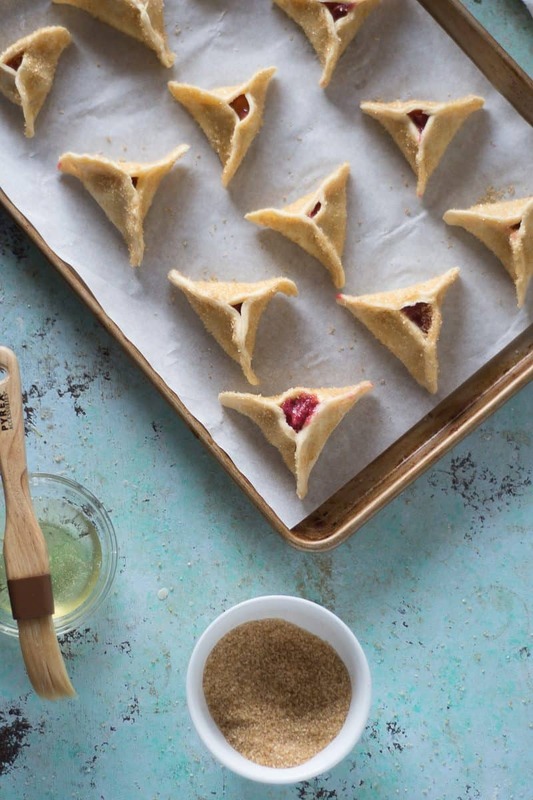 Haney seals her turnovers completely, but I like to leave the center a little open so the filling can peak out, which leaves them looking a bit like the oversized cousins of hamantaschen. 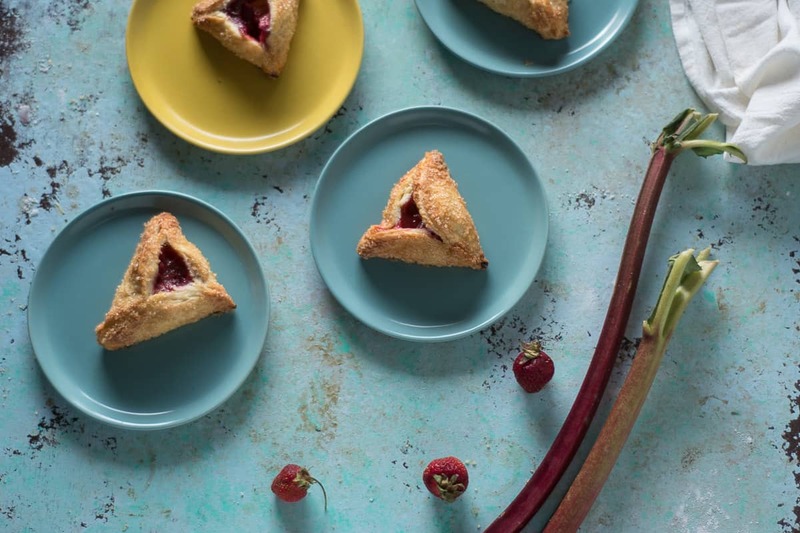 These strawberry rhubarb turnovers are flaky, delicate handheld pies. The cream cheese dough needs time to chill. At least 2 hours but preferably overnight (especially if you're working in a hot kitchen), so get it going ahead of time. The filling comes together quickly and gets a bake in the oven to thicken first so that it doesn't make an unholy mess of the turnovers. My favorite coarse-grained sugar to use is demerara, which has a lovely caramelly flavor, but turbinado or raw sugar is also delicious and much easier to find. If you're serious about pie, you should definitely buy Paula Haney's book and visit one of her Hoosier Mama Pie shops if you're in Chicago or Evanston. Their pie is amazing (some might say damn fine). Combine all of the ingredients (flour, cream cheese, butter, sugar, and salt) in the bowl of a stand mixer fitted with a paddle attachment and mix gently with your hands until all of the butter and cream cheese is coated with flour. Pulse the mixer on and off on low speed until the butter and cream cheese look like pea-sized rubble. Put a dish towel over your mixer (seriously, do this) to prevent the flour from flying out of the bowl and mix on high speed until the dough comes together in a big chunk, about 30 seconds. Flatten the dough into a disk, wrap in plastic wrap, and refrigerator for at least 2 hours, preferably overnight. Preheat the oven to 400°F. 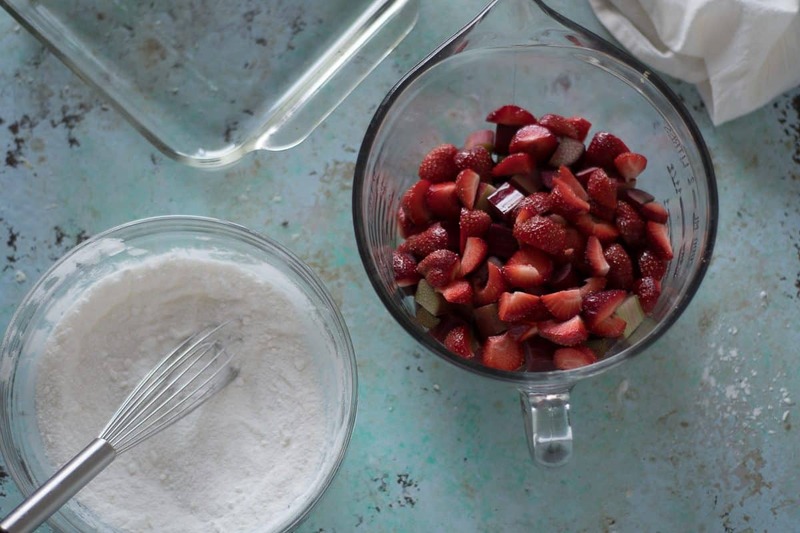 Combine all of the ingredients (rhubarb, strawberries, sugar, cornstarch, salt) in a small nonreactive baking dish (a 9-inch pie plate or 8x8-square would do nicely), and stir until the fruit is coated. Bake until the fruit is soft and the mixture has begun to thicken, about 30 minutes. Open the door, pull out the rack, and give the mixture a stir halfway through the baking time to make sure all of the sugar dissolves. Take the dough out of the refrigerator. If it has been chilling overnight you'll want to let it sit at room temperature for about 5-10 minutes or until feels pliable enough to roll out. Line a baking sheet with parchment paper. Dust a work surface and a rolling pin with flour and roll out the dough until it is about 1/8 inch thick. 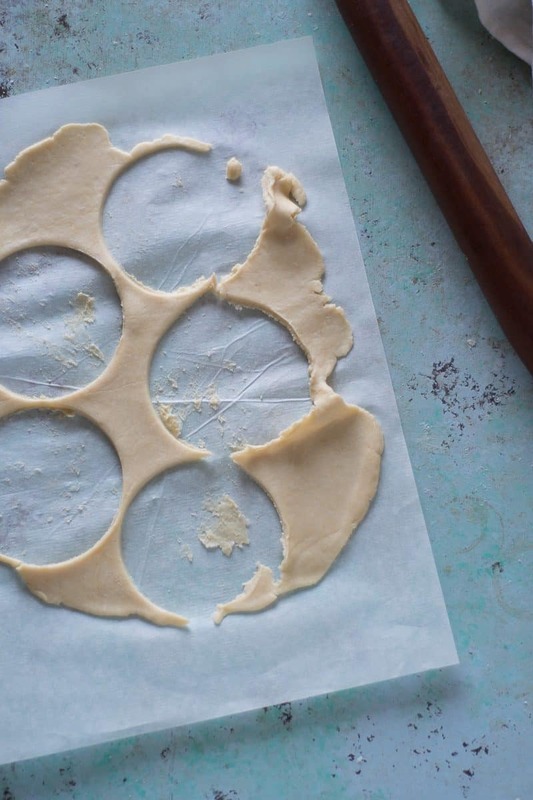 Cut out 4- to 5-inch diameter circles with a round cutter (or a lid or small bowl of that diameter) and transfer the dough to the lined baking sheet. Gather up the dough scraps and reroll and cut out more circles until you've used all the dough. You should get about 12 circles (but it may vary a little depending on the diameter of your cutter). Chill the circles of dough in the refrigerator for 30 minutes before filling. Remove the circles of dough from the refrigerator. Have your filling ready and your egg whites in a small bowl. Brush egg white along the edge of each dough circle. Add 2-3 tablespoons of strawberry rhubarb filling to the middle of each circle. Lift 3 points of the circle up and pinch along each edge until they form a tri-cornered hat (after you do this once or twice it will be a cinch). You can seal them all the way to the center or leave a little space open in the center to let the filling show if you like. 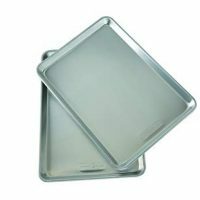 Place each filled and shaped turnover on a parchment lined baking sheet, leaving at least 1 inch of space between them. Preheat oven to 400°F. Fill a small bowl with big-crystalled sugar and have your egg whites ready. Take the turnovers out of the freezer and brush the 3 sides of each turnover with egg white. Hold the turnover over the bowl of sugar with one hand and pat sugar onto each side of the turnover with your other hand. Do this to all the turnovers. Bake for 25-30 minutes or until the turnovers are dark golden brown. Let cool. Serve or store in an airtight container at room temperature for up to 2 days. I love this recipe! My pies skills are not strong either and I have a bunch of rhubarb wilting in my fridge right now which is perfect! I love the sound of this pastry too. This pastry is amazing and so much fun to work with! It’s great for those of us who struggle with the traditional pie but love flaky crusts! Rhubarb reminds me of my childhood as my gramma had it in her garden. I would love to eat it straight from there but the one used in pies is super delicious too. Thanks for sharing this recipe. Thanks, Edyta! 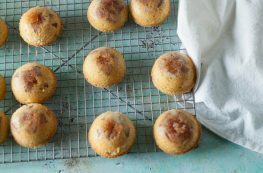 I’ve always found rhubarb a bit too puckery to eat straight, but I love it in baked goods! I love that I don’t need to break out forks for this dessert! 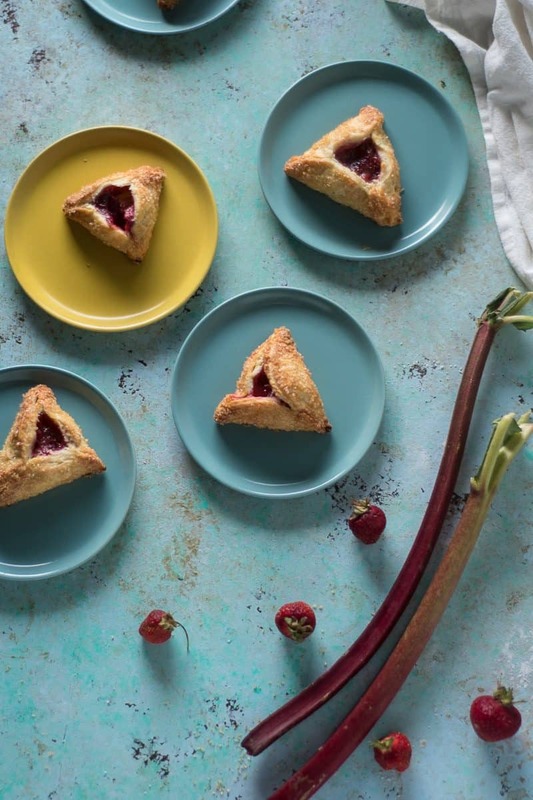 I’ve never had rhubarb turnover, these looks so tempting, I might try too. When I was growing up, we had a huge rhubarb plant in our back yard. My grandmother used to make the best rhubarb pies and strawberry-rhubarb tarts. This looks like it could rival hers!! Great recipe! 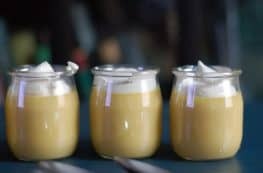 Now, if only I could find rhubarb in the stores, I’d be making this soon. We had rhubarb in the backyard when I was growing up, too. It pained me the first time I had to buy it! These sound incredible! They’d be perfect for entertaining! Thanks, Cliona! You’re right that they’re wonderful for a crowd! And they’re great for a picnic where you don’t want to schlep plates and silverware, too.